Black locust (Robinia pseudoacacia) near Scout Field on the Federal Farm in 2012. Black locust (Robinia pseudoacacia) is native to the Southern Appalachians, the Ozarks, and other parts of the mid-south, but it has been widely planted outside its original range since the early twentieth century. According to the 2002 stewardship plan, it is present in a 2-acre area at the extreme southeast corner of the Federal Farm property. It has also been observed (in 2012) between the western hedgerow of Scout Field and the main trail in the central part of the Federal Farm. Cornell Cooperative Extension’s New York Invasive Species Clearinghouse gives black locust a relative invasiveness rank of 81.11 (very high, and interestingly 0.11 higher than common common buckthorn). 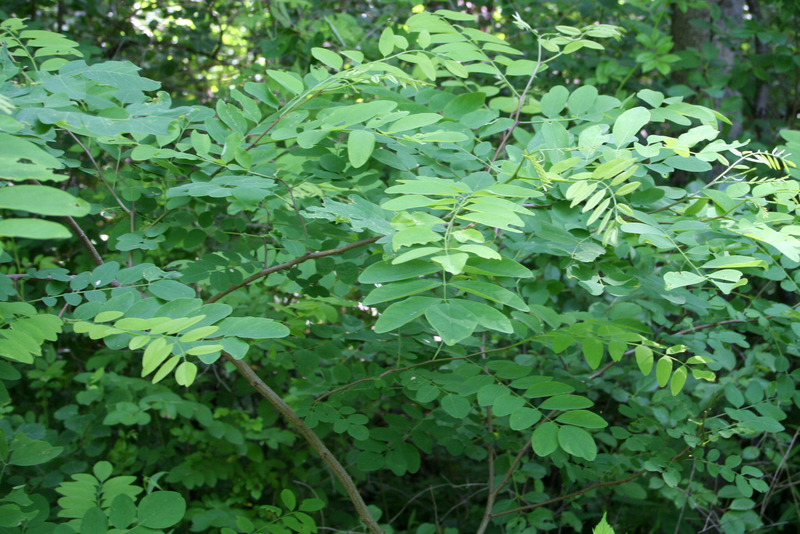 Black locust is also on the DEC’s list of regulated plants (along with other “too-big-to-fail” plants like Norway maple). According to the Nature Conservancy’s Global Invasive Species Team, black locust’s primary invasive potential is seen in the open, sandy prairie and savanna regions of the Midwest where it can dominate and shade out the native plants. Although black locust is less likely to become a problem in our more-wooded environment, it should be monitored for any invasive tendencies, and spreading should probably be discouraged. The Nature Conservancy: Element Stewardship Abstract; Carmen K. Converse, TunyaLee Martin, 2001.